Have I missed your favourite radio station? There's a great list of Windows Media Audio and MP3 streams at www.radiofeeds.co.uk that you can use to add your own station as a custom stream in the gadget (other audio formats, such as Real Audio, won't typically work). The BBC used to only stream the national stations using Windows Media Audio streams; but their local radio stations are now available (in mono) using WMA. I would consider adding a load of new stations to the gadget (all of the local BBC ones, others that people have suggested to me by email), but there are so many (and they often change) and it's hard to find the time to consider updating things. To be honest I didn't expect people to still be using my gadget after 3-4 years! What happens if the location of the internet radio stream changes? Simple, it'll stop working on my gadget. Okay, it's not quite that bad. In the latest version (and several older ones), I use my server to redirect listeners to the real location of the internet stream. This means if something changes I can update it once on here and it'll start working for everyone again. It saves you from having to download a new version of the gadget every time a stream changes. I should point out that as the requests go via my server I technically know what you're listening to, as each request is automatically logged by IIS (along with all other requests, including the script kiddies looking for "cmd.php" and the "admin" folder that doesn't exist). I'm not trying to track users (I honestly don't have the time, even if I wanted to), and I don't even log which stations are requested (I did at one point in the past to get an idea of the most popular stations). I've had a few people email me because they're having problems playing custom streams. The problem is typically because you're trying to use the URL of the webpage, and not the URL of the stream you want to listen to. For example (this is an old one, it might not work anymore), here is the URL of a webpage where you can listen to music: http://rope.icgo.fimc.net/staticweb/onair_players/one_network/playerV5.asp?station=2ten - this is not the URL to paste into the gadget. The URL I just mentioned contains an ActiveX control. You need to View Source of the webpage, look for the ActiveX control, and work out the URL that it's playing. The easiest way is typically to search for ".asx", but sometimes you may have to look for the "FileName" (and some stations use a token in the URL that changes every 15-30 minutes). In this example, the URL is http://mediaweb.musicradio.com/playlist.asx?streamid=10 - this is the URL to paste into the gadget. The best way to test if you're using the correct URL is to try and open it in Windows Media Player (press Ctrl+U). If you hear music, then you've found the right URL. If you get the message "Windows Media Player cannot play the file. The Player might not support the file type or a required codec might not be installed on your computer." then you're not using the right URL. I wish there was a less complicated way of doing it, but there isn't. This is what I tend to have to do everytime someone suggests a station to be added. If you're struggling to add a custom station yourself, I might add it to the next version of the gadget. If you want to add more than 3 stations, you'll have to edit the stations.js file. I hope to provide instructions on how to do that at some point, but it's a bit crude. Version 1.2.9 (and onwards) lets you control the volume using the wheel mouse. It's great, try it! You can still use the - and + buttons on the "Advanced" themes, but scrolling the wheel up and down works with all of the themes, and it's quick and simple (as long as you've set the focus on the gadget, e.g. by clicking on it, and scroll the wheel while the cursor is over the gadget). Version 1.3.0 introduces the classic idea of presets for radio stations. Similar to many car radios, you have 6 preset buttons that you can assign radio stations to. As of 1.3.2 (it was meant to be in 1.3.0 but I totally screwed up that release), hovering over the preset buttons will reveal the name of the station (if one is assigned, by default they're all blank). Clicking on the button will jump to the station. To set a preset, use the Options, select the station in the drop down list, then click one of the grey preset buttons below it. Version 1.3.2 is a bit more user friendly when adding presets (i.e. the name appears to the right of each button). The preset information is only saved if you hit the OK button, hitting cancel or pressing the escape key will make it forget your changes, just like when selecting a radio station. Why can I only see dynamic information for the BBC Radio stations and Heart Digital? Simple. Because the BBC offer a nice XML API to get the data, and because I've coded a quick and dirty script for Heart Digital that returns the information based on the schedule listed on the website (hardcoded, to reduce bandwidth/save me querying their server too often, so if they ever change the schedule it will be wrong) and the current time on the server. It's a pain to write the code to compare the server time to work out what show is currently on that station, I'll see if I can work on the flyout information based on the popularity of each stream. Yes, I know a few of them aren't great, but there are a couple that look pretty darn good if I do say so myself. I'm not an artist. If you've designed your own themes and would like to see them included in future versions of the gadget then please let me know. I might not be able to accept all of them, and some may require a little tidying up (in many cases because I'm still changing things behind the scenes - as you may have noticed, the gadget has grown organically, and I'm often fighting/majorly rewriting it to add new features). Thanks go to ziggyred for his Vista theme! Apologies if I update a theme and you don't like the new images/look, but hopefully all changes will be for the better. 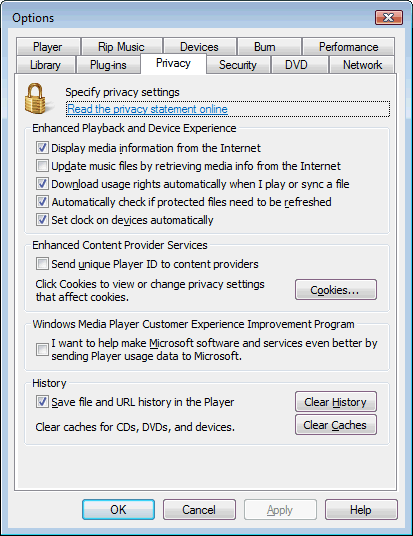 This appears to affect (some) Windows 7 users, but might affect some Vista users too. For some reason the gadget (and other gadgets) will play up and display this error message (I recently saw it for the first time). The fix is to open all of the HTML and JS files in the gadget's folder and save them again as Unicode instead of ANSI. I may submit an updated version of the gadget to Microsoft with Unicode versions of the files. Your gadgets are located at C:\Users\[username]\AppData\Local\Microsoft\Windows Sidebar\Gadgets\. First of all is the big disclaimer: many of the stations listed on the UK Radio Player gadget are only made available to UK listeners. This usually means those of you with an IP address based in the UK. If you can't hear the streams (even via the station's website, or following a link from www.radiofeeds.co.uk) then this could be why. For technical people that are based in the UK (e.g. some AOL users) and can't hear the streams, you should be able to get around it by using a UK based proxy server. If you're unable to play it through my gadget, but it plays okay through their website, let me know as they might have changed the location of their internet stream, and I'll need to update it on my server. I haven't had any problems with the audio. I have two default (clean) installs of Vista (with UAC enabled), and I can't replicate the issues that a few people are experiencing. It's tempting to let them fix the problem themselves, as I expect it's something they've done that has inadvertently stopped the gadget from playing the streams, but it'd be a bit mean of me to do that. Plus it might be a genuine bug. If anyone else has problems, please can you answer these questions rather than simply saying "it doesn't work", as it might help me work out where the problem lies (i.e. is it something wrong with the gadget, or is it something that you can correct on your PC that I can suggest to other users?). I'll replace this with a proper FAQ sometime, when there are more answers, and perhaps more questions. Have you tried resetting your Internet Explorer settings? Open IE and go to Tools -> Internet Options -> Advanced and click the "Reset..." button. What does the status say? Is it stuck on "Transitioning" or "Buffering" when you're using a simple theme? or not even getting that far? Are you able to stream music from the BBC or Classic FM websites (for example)? If you can hear the stream, check that you're listening to the Windows Media Audio stream and not the RealAudio stream (the gadget uses the former). You obviously found my website, so that must resolve correctly, but I then redirect users to the real location of the streams. Can you hear BBC Radio 1 okay (in WMP/Winamp/whatever you normally use) if you click on this link? One person said his gadget is stuck on "Buffering" and plays 3 seconds. If he removes and adds the gadget he gets the same thing. If it says buffering then it probably got to the stream okay, and it might be worth checking your WMP settings. It might be worth checking if it only affects one station, if that's the case then it's a problem with the stream (maybe their server is playing up/busy?) rather than the gadget. I've also come across a similar problem on another site, and WMP's Error Details suggests that there's a problem where the UDP traffic isn't making it to the computer - so it might be a firewall related problem (or caused by NAT). You can control the range of ports used by the different protocols, so you might be able to define a narrow range and let them through your firewall/set your NAT router to port forward the traffic to your PC. I'm sorry if it takes me a while to come up with a new version (I tend to write new code at the weekend, debug it during the week as I use it in anger, then upload it to Microsoft's site for their approval), that the flyout information isn't complete for all of the stations, that I haven't been able to polish off the graphics (I tend to make temporary graphics when adding features and never get around to replacing them), or make the gadget use transparency in a way I'd like to (things typically go purple when they overlay semi-transparent images, it's a known problem according to Microsoft). I know that most of you appreciate the gadget (please rate my gadget on the Live Gallery! ), and I hope that most of you love it. But (probably) just like you, I also have a day job that pays the rent mortgage. I also like to unwind, visit friends, and work on various other little projects (e.g. an improvement to Luke's Info Sender plugin, to stop it crashing Winamp whenever I lose my net connection, and hopefully solving a URL encoding issue and I like to contribute towards Nmap). I also watch far too much TV and eat too much chocolate, miraculously I'm not overweight. If anyone spots any bugs, please let me know. If anyone has any great suggestions on how to improve my gadget, please send me an email (I do have a few ideas in mind, see below). EDIT: Apologies for not providing an update in over a year - I don't know if there will ever be a new version, if there is it'll probably be after a major rewrite. If you're experiencing the transparent gadget issue in Windows 7 you're probably still using the Release Candidate - Microsoft fixed this in the RTM version so please go and buy a legal copy of Windows 7!